Saturday, Aug 18, 1888 Cool morn, but heating up with one of hardest showers mid P.M. & light showers later. Ellery on hand & at usual duties, with some extra about home of course, rec'd another letter from Charlotte reporting "Millie Adams" & all as doing well, she thinks of remaining with them couple weeks longer. As well self tho' had half "unconsciousness" while at breakfast, with sweeping chamber busy at chores about house most A.M. taking meals as of late. Sunday 19 Warmer, & more pleasant again. Ellery not well as sometimes but had our breakfast at about usual time, he attended service A.M. & also at s-school as usual. 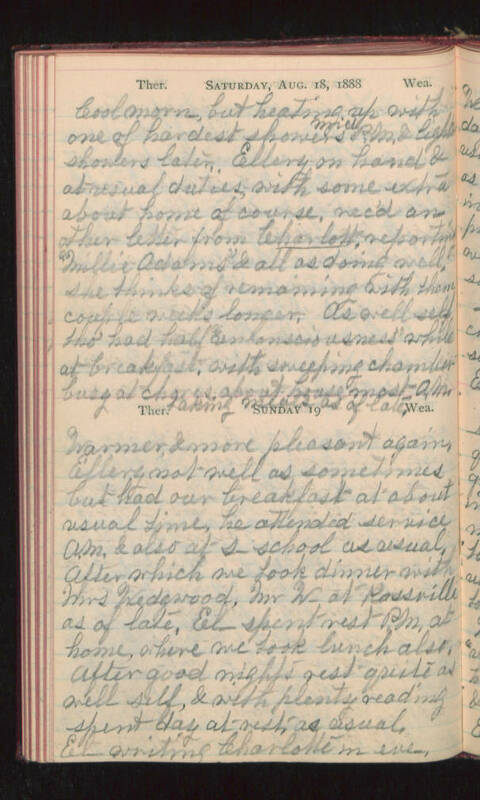 After which we took dinner with Mrs Wedgwood, Mr W- at Rossville as of late, El- spent rest P.M. at home, where we took lunch also. After good nights rest quite as well self, & with plenty reading spent day at rest, as usual, El- writing Charlotte in eve.